Maintain the clean view over the handlebar. This unique Combination Speedometer/Tachometer allows you to monitor engine speed without adding a handlebar-mounted tach. As a result of different Original Equipment capabilities, the following exceptions apply: Fuel functions are not available on 2004-07 models; Range function not available on 2004-06 XL, 2004-08 Dyna®, and 2004-07 Softail® and Road King®. 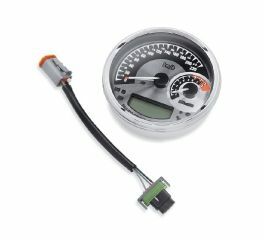 Fits '04-'11 Dyna®, '04-'10 Softail® (except FLSTSE) and '04-'13 Road King® models (except '07-'08 FLHRSE) equipped with a 5" Speedometer.